Finally a Book that connects the dots! In my last order of Coconut Oil from Tropical Traditions I dropped a book into my shopping cart. My family was suffering from the flu plus a bacterial infection, resulting in some pneumonia symptoms. In the meantime, the flu shot clinics were out of vaccines in my community and emergency medical workers were complaining that they didn’t get the shots before the clinics ran out. While we have never gotten a flu vaccine, I saw in the latest flyers advertising the flu shot clinics, that they were recommending that all poultry owners get their flu shot. “That’s a new one!” I thought. “Trying to increase their market share. But why is the government involved in advertising for a multinational corporation with my tax dollars?” So with these thoughts in my head, I was excited when the book, Fowl! arrived from Tropical Traditions. It reads like a medical thriller. I read it in two days, unusual for me with 4 or 5 books partially read, decorating my coffee table. You’ve probably heard all the hype over the H1N1 and H5N1, Swine Flu and Avian Influenza – the key triggers for the well hyped worldwide pandemic that will slaughter an apocalyptic number of the world’s population, unless everyone gets an annual flu vaccine, side effects not withstanding. You may have even gotten an email from your pastor (rabbi, imman, or chaplain) telling you about the nearest needle jab clinic, and advising you that all good (insert your religion or denomination) ought to indulge in the hype and get a vaccine for the good of the community. 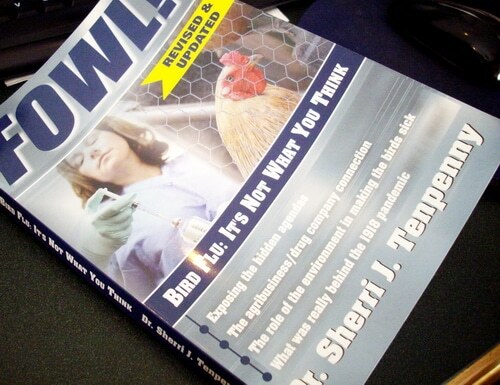 This well researched and well written book shows the connections between vaccines, avian influenza, the massive culling of backyard poultry flocks and small livestock farms, agribusiness, and the food, medical, and pharmaceutical industries. It reveals with dates and facts, how Big food, Big pharma, and world governments are putting the interests of multinational corporations ahead of you and me. If you had a sneaking suspicion that maybe getting the flu vaccine wasn’t a good idea, reading this book will show you where that idea is coming from and why it’s good to trust your intuition. This book will tell you what’s actually in that needle. Thoroughly documented, it reveals connections and motivations that the players don’t want you to know. Like the massive 1997 beef recall that crashed the stocks of Hudson Foods, allowing Tyson to purchase Hudson stocks at rock bottom price, all over an E coli scare that was never evidenced. (p. 162). Yes, this is actually connected to the push for flu vaccines and the threat of a worldwide pandemic. My personal interest in this book was that I witnessed the 2004 Avian Influenza crisis in British Columbia, Canada. 17 million birds were slaughtered by French speaking CFIA agents from Quebec. They entered small farms with backyard flocks. They refused to observe basic bio-security measures, (even when requested by the farmer) and tagged birds, testing them for the AI. A week later they’d come back and repeat the procedure. Many small farms, having been free of the disease for the first two testings, were told on the third or fourth or fifth testing their birds, although asymptomatic, had antibodies. The birds were culled. Circles were drawn on maps and any birds, including indoor parrots and racing pigeons, within a 5 km radius of an infected bird, were killed by carbon monoxide poisoning or just shot out of trees. Strangely, the disease refused to cross the Fraser River, and small flocks in Mission, well within the 5km circle of the original outbreak, were spared. On the other hand, the farmer on the original outbreak farm repeatedly past the bio-security check points, set up by the CFIA to contain the spread of the disease, with manure on his tires and was waved through, without having to ungo any bio security measures, infuriating his neighbours. . Wild birds were not culled; only back yard flocks and poultry operations with 100s of thousands of birds. The culling didn’t stop until one hobby farmer, along with her neighbours, stood up to the CFIA bullies and refused to let them on her farm, citing bio-security measures. A judge agreed. The culling of healthy back yard flocks stopped overnight. Meanwhile, international borders were closed to all BC poultry products — swinging the door wide open for poultry products from Quebec and Ontario to pick up the BC market share in Asia, Europe, and the United States. While at the same time, multinational corporations built their infrastructure of factory farming of poultry in Thailand, China, and Vietnam, and the local MacDonald’s, where my son was working, started carrying cooked chicken from Thailand. At the time I wondered what weird thing was going on. This book shed some light on the events in my own community in 2004. The phenomena of culling hundreds of thousands of perfectly healthy birds, in order to stop the fictional spread of Avian Influenza has destroyed the living of small subsistence farmers in the poorest parts of the world, while enriching the assets and stock holders of multinational corporations, worldwide. It’s legalized bioterrorism sponsored by governments in bed with the major corporations worldwide – drug companies that produce both the flu vaccine and antibiotics; chemical companies that produce drugs, fertilizers, herbicides, and chemical and biological weapons; feed companies that cater to feedlot farms and provide grains and seed to the food industry; meat producers and processors; cancer clinics and hospitals; and the United Nations World Health Organization. They are all a part of the drama and part of the imaginary impending pandemic. And when you examine carefully the financial connection of the major players you find, surprise, a fiduciary interest in the outcome where small farms are put out of business and factory farming takes over market share and land assets, and people get more and more dependent on drugs and vaccines and an industrial food system. Dr. Tenpenny demonstrates with thorough research the connections between sick birds, sick humans and the tragic chemical toxicity of the world’s wetlands and water sources. Tenpenny isn’t content to show a circumstantial connection just in the recent occurrences of bird flu but instead goes back to the small pox epidemics and the Spanish flu epidemics after World War I. She demonstrates the strong connection between the chemical warfare of the war years and the subsequent epidemics that followed. You will see that the connection between sick birds and sick humans is not a virus per say, but rather the toxicity of the environment which weakens the immune system of both birds and animals and results in flu fatalities. If folks in your community are dying from the flu – check the environment for dioxin – the reaction of chlorine with wood pulp – and other chemicals. People exposed to toxic chemicals, including those found in the flu shot, are more likely to die from flu complications than those whose immune system is unaffected by toxins. After you read this book you’ll understand why it’s imperative that you protect your own immune system and your local organic farmer. If you are impassioned after reading this book, Dr. Tenpenny offers some action steps for activists in the last chapter. Reading this book will arm you with the facts to combat the propaganda that is being fed to you and your friends through the media, and your local public health or vaccination clinic. Recognize the propaganda for what it really is – even when it is coming from your pastor or rabbi – and take the action steps to protect your family. What can you do to prevent becoming a statistic in the latest hyped flu pandemic? Strengthen your immune system by drinking pure, un-chemicalized water. If your water is tainted get a Berkey filter with the additional chlorine filter to have a safe, and constant source of clean water. Vitamin C, Apple Cider Vinegar, Lemon Juice, will help detoxify your body of harmful chemicals. I buy my apple cider vinegar from Tropical Traditions, too. If you haven’t already, switch to locally raised, grass fed, organic meat and poultry. If you don’t have a local supplier, Tropical Traditions also carries these premium quality meats. If you are local to me, Joybilee Farm still has a few freezer lambs available this spring (2014). Stop eating processed food and start cooking from scratch using organic and nonGMO ingredients. GMO food has been sprayed with a soup of toxic chemicals, further polluting the water supply of local communities. Do not get the flu vaccine — there is a high incidence of toxic reactions to the flu vaccine. Make your personal and family health and wellness a priority this year. Read this book. I don’t do facebook, but I vote for ebook#1, as mentioned in your newsletter.